If you're like me, you were always jealous of the kids with rich parents who got to ride around in their own Power Wheels cars. Now that I am tall enough to sell my body and time, I find myself attaining childhood dreams like buying my own Power Wheels car. 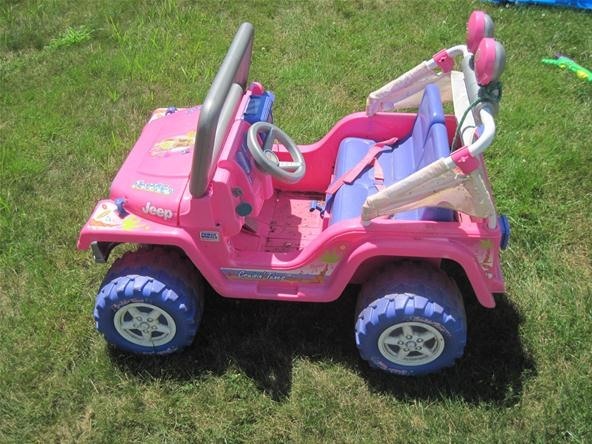 I would not have chosen the Barbie Jeep given the choice, but 40 bucks on Craigslist is an amazing deal. Yay! 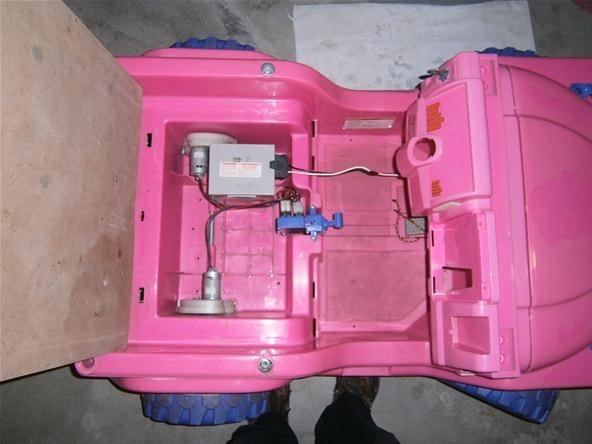 A Power Wheels car! But what's this? I am too big to drive it?! WTF, space time continuum. Release me from your four-dimensional shackles! After coming to terms with not being able to finally use my power wheels car, I hit on the best idea I have ever had. 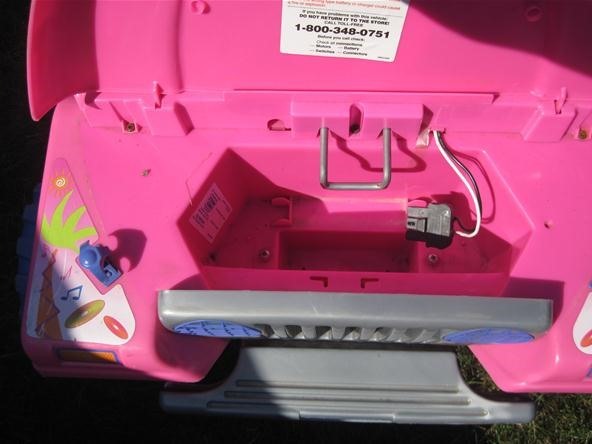 Remote controlled Barbie Jeep. Nothing beats an RC Power Wheels. 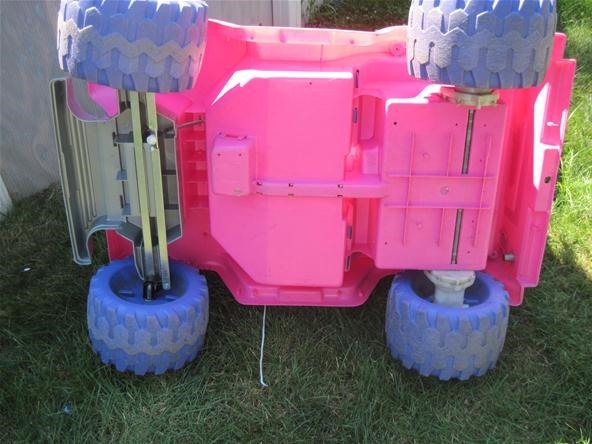 Unlike most RC cars, the Power Wheels is actually large enough to be used as a tool! It can carry lots of things—children, ammunition, fertilizer—whatever you need. In my case, I thought hobby rockets would be the best thing to haul around. Time to clean off the cobwebs from your car and get an idea for how it works. On the underside you can see that the front and back wheels are different. The front wheels control steering and have a long metal steering bar attached to one side. 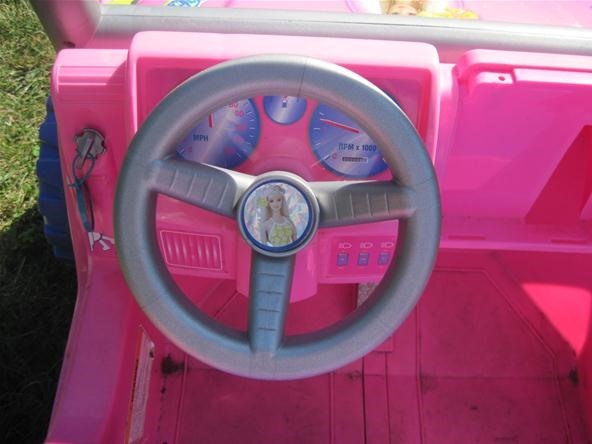 The white knob on the left side of the upper bar connects the steering wheel directly to the steering bar. The back wheels are driven by the motors and provide the forward thrust for the car. Don't take apart the white gearboxes unless you know what you are doing! I left mine safe and undisturbed. Notice the conditional nature of the fires below. 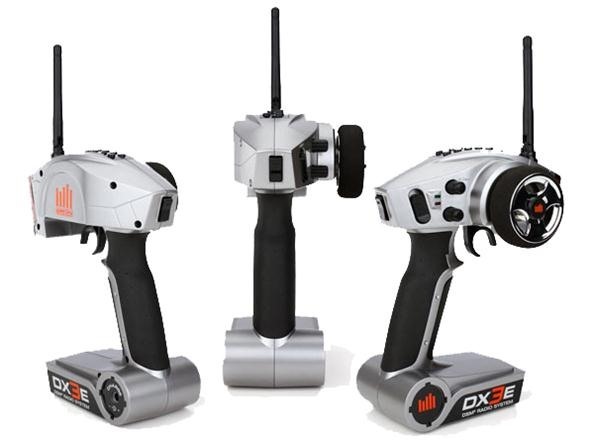 To do this project, you will need some basic knowledge of remote control devices. Luckily, there isn't much to most hobby controllers. 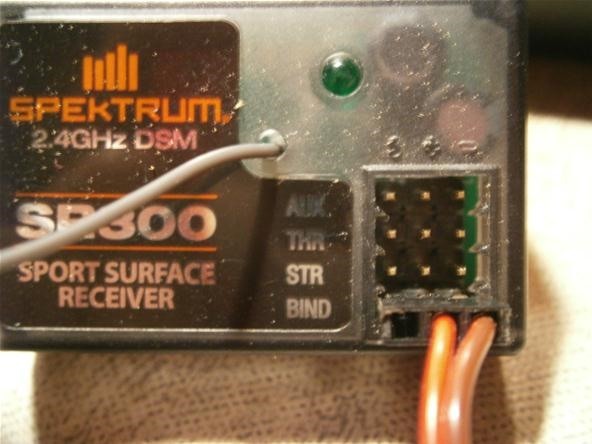 Below is a transmitter. The ground types like this normally have a steering wheel on the side and a trigger underneath for throttle. I wanted a third channel, so mine has a button behind the the grip that activates an auxiliary channel. This is the actual brand and model I have and I highly recommend getting this one if you are looking for your first radio. Below is a receiver. This is what you put in your car to make it receive your radio commands. It has four plugs with three prongs in each plug. The top three are radio channels and the bottom one brings power to the receiver. The channel plugs are each labeled with a specific assignment. The top one is the auxiliary channel for death rays and bubbles and what-have-yous. The second channel is the throttle. This controls backward and forward motion. The last channel is the steering. Left, right, straight, you know the deal. For this project we will use the throttle and steering channels to control the car, and the auxiliary channel to activate the rocket. When you wire up your car, be sure to plug the giant servo into the steering channel and the smaller servo into the throttle channel. The auxiliary channel can use any servo that is sufficiently strong enough to push the button shown in Step 7. When connecting your servos, be sure that the black or brown wire is on the pin marked with a "-" (right side in this case) and that the white or yellow wire is on the pin marked "S" for signal (left side in this case). We want our car to drive around and terrify the neighbors, but if we cannot fit in the car, how do we press the gas pedal? Below you can see my solution to this problem. A servo is screwed into the plastic above the pedal. 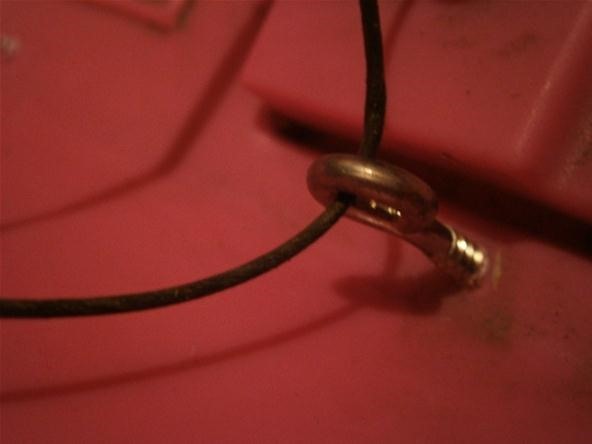 A steel wire runs from the servo, through an eye hook, and to the top of the pedal. When the servo pulls the wire up, the force is redirected by the eye screw and pulls down on the pedal. All of the screws in this build (including the eye screw) are wood screws. Their pointed ends make them perfect for screwing into plastics. 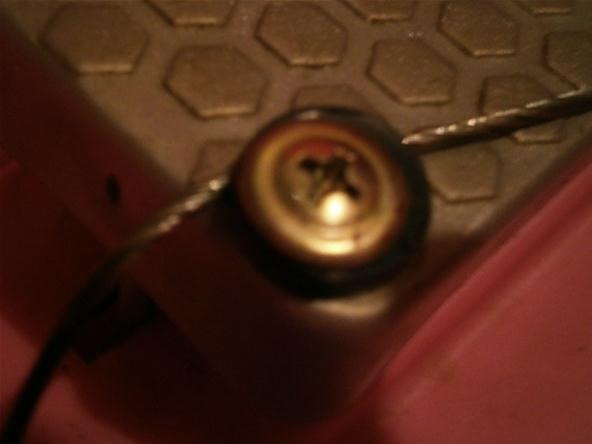 Originally, I had the pedal fastened to the wire using only a metal screw. After a few pulls, the wire would slide out. I solved the problem by putting a rubber washer on the screw. This catches the wire and gives the pedal a better grip. To automate the steering, I ripped out the rod connecting the steering wheel to the steering bar on the front wheels. 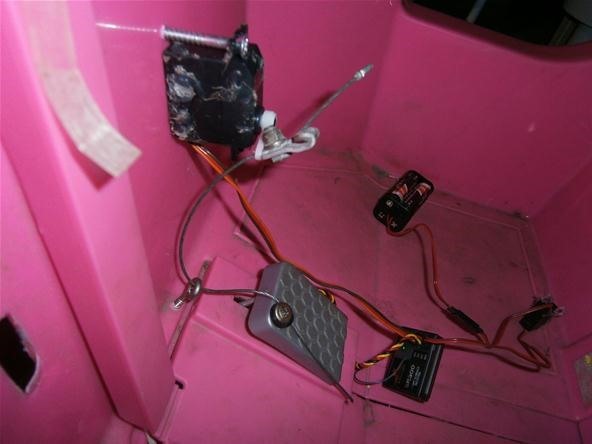 As with the pedal servo, I used wood screws to fasten my giant servo directly next to the front steering column. 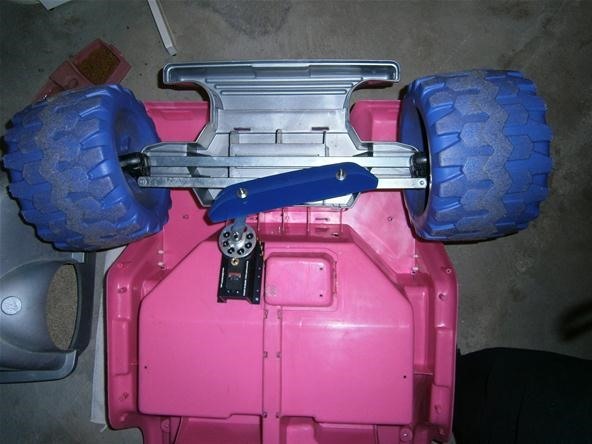 Ideally, you would use another steel bar to connect the servo to the steering bar, but hard plastic will most likely do the job. I used an old silk screen squeegee. You will need two arms to connect the servo to the steering bar. One will come from the servo extending the servo's reach. The second will come sideways from the end of the first bar and fasten to the hole in the steering bar. My chassis had and angled bottom just before the front wheels. Find the orientation that allows your servo to move the steering bar with as little bending in the servo arms as possible. To minimize the effect of the servo being mounted at an angle, I put rubber washers in-between all the nuts and bolts holding the squeegee to the steering bar and servo. If you are running your car on grass, there is a good chance that the tires will spin free without the weight of a child holding them down. To get some more static friction, screw some old bike tires into the back wheels of the car. I only had road bike tires, but even these thin ones made a huge difference! One contributing factor to the wheel spin problem is that the battery under the hood of the car places all of the weight at the front far away from the drive wheels. 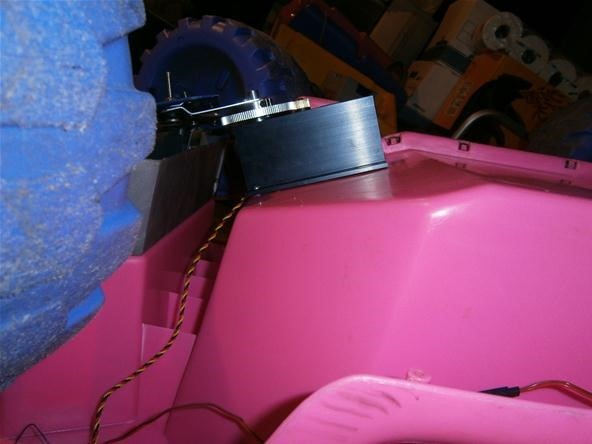 I ran the battery cable to the back of the car to move the weight on top the drive wheels, as shown below. 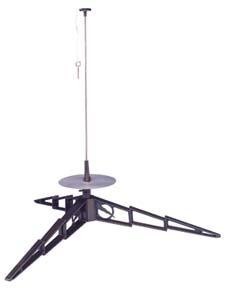 Most hobby rocket kits come with a metal platform with a thin rod for mounting the rocket and for guiding it straight upwards upon take off. This is what we need to mount on the back of our jeep to make it into a rocket launcher. Using wood screws, mount the platform either on the hood or in the back floor of the car. 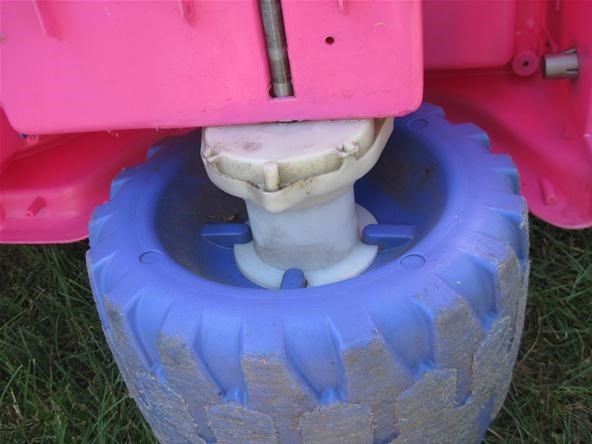 Screw directly through the plastic platform legs and into the plastic car body. Be sure to point the platform in the direction you want to rocket to travel! Hobby rockets also come with a nifty ignitor box. All this box does is complete a circuit to spark the electrically activated engine ignitor wire. We will be replacing the ignitor box with our own switch because we are cool, and because the safety mechanism on the store-bought ignitor box makes it hard to automate. For more info on ignitor setups, see this page. 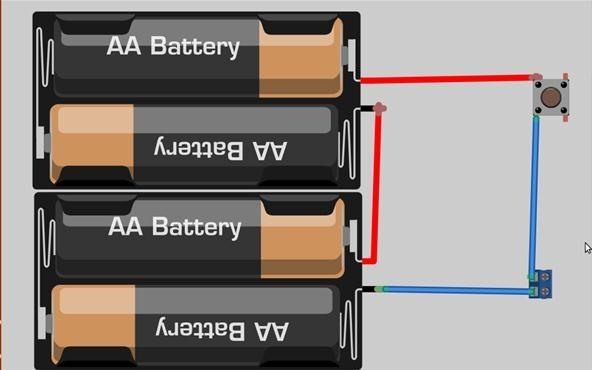 To make your box, simply wire a 4 AA battery pack to a push button switch, as shown below. The screw terminals at the bottom right provide a reusable socket for connecting up the electric match ignitor wire. Here is the awesome part. To activate the rocket, we just need to position a servo to press the push button that will complete the circuit and activate the electric ignitor wire. 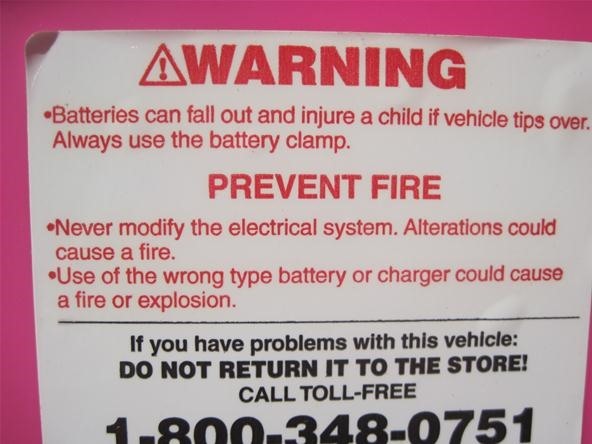 Keep in mind, this system has no safety precautions built in and is potentially dangerous to use. Always wear protective gear and never wire up the rocket until you are ready to launch! The ignitor wire is inserted into the bottom of the rocket so that it rests against the bare engine propellant. Time to test it out. Bring it outside and see what it can do! 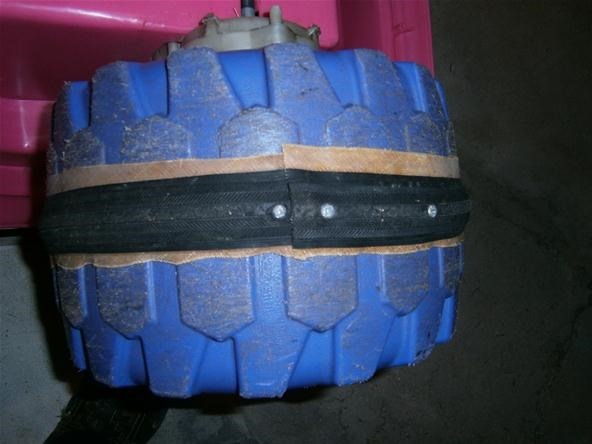 You may need to play around with the ballast to get the wheels gripping the road. Don't forget to charge your battery the night before! Those things take 8 hours to charge up. 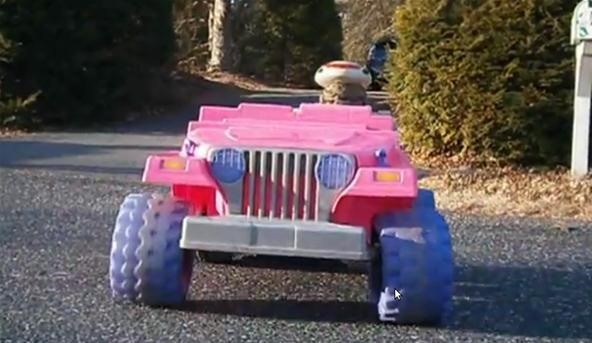 Now that you have a remote controlled Power Wheels car, what are you going to do with it? I am making a mobile rocket platform, but there are a million practical things to do with these cars. You could even make it a full-fledged robot and tell it to autonomously carry water, search the dessert for ghosts or radioactivity, or whatever you are into. You should add the safety to the transmitter. The problem is that the safety in the original box required you to stand there and hold a key down while pressing the fire button. I can't ask anyone to stand next to the car when the rocket goes off. I love this idea I built a submersable rocket launcher a couple years ago. The problem is that I couldn't load a rocket and expect it to fire when wet. It worked as a floating launcher and a submersable after launch. 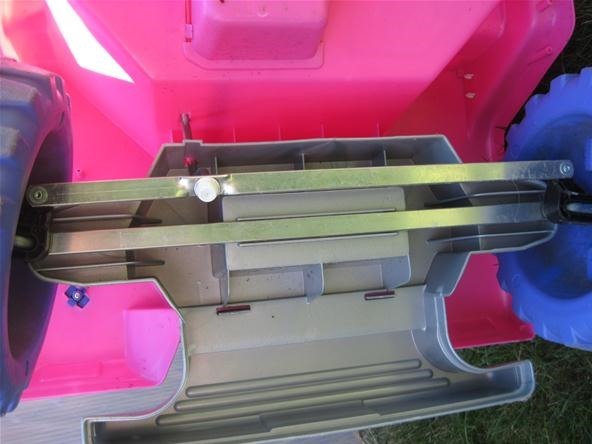 It was made of a milk crate and bilge pumps for the motors. You have inspired me to build another launcher for land. Mine will be a bit more complex though. It will be a platform of my own making and a bit more versitile terain wise. But good job on the mod. Thanks Jeremy! Do you have any pictures of your submersible? Unfortunatly I don't. I used to have video but it was corupted on a flash drive. The only copy left after a lightning strike to the house fried all of my computers and electronics. I have only recovered bits and peices. If I build another one I will post pics and a video.